AMMAN – Under the patronage of HE Dr. Talal Abu-Ghazaleh, the Jordanian National Orchestra Association (JOrchestra) and the Musicians of the Savolinna Music Academy of Finland presented a classic music concert conducted by Maestro Mohammad Sidiq at the Al Hussein Cultural Center in Amman. Attended by the Spanish and Indonesian Ambassadors to Jordan as well as heads and members of diplomatic missions in the Kingdom, the concert presented romantic musical pieces by Finnish composer Jean Sibelius 1865 –1957. Sibelius music had a significant role in forming and affecting the Finnish national identity, his main set of music are the seven symphonies. Attendees also had the opportunity to listen to the amazing pieces by composer Wolfgang Amadeus Mozart (1756- 1791) in addition to music of Ludwig van Beethoven (1770- 1827). Finnish Mark Gothoni (violin), Yuko Myagawa (cello) and Paavali Jumpannen from the Academy participated in the event. The concert started with the Waltz Triste by Sibelius that he composed for his brother-in-law Arvid Järnefelt's 1903 play Kuolema “Death” that gained fame as a separate concert piece. Musicians delighted the audience with Mozart Eine Kleine Nachtmusik K. 525: Allegro - Romanza - Menuetto – Rondo which is considered one of his most famous pieces of music The work is written for an ensemble of two violins, viola, and cello with optional double bass, but is often performed by string orchestras. The musical concert concluded with Beethoven Concerto for Violin, Cello, and Piano. 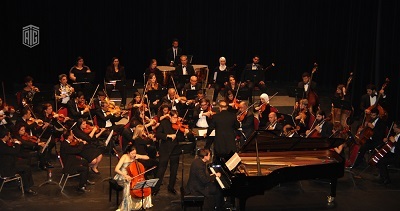 The continuous cooperation with international musicians and conductors is the mission of the Jordanian National Orchestra Association, aiming to enhance the musical scene in Jordan and the region by promoting cultural exchange as a tool of social cohesion, and to provide economic opportunities in a new sector, for the development of the civil society.